If you’re looking to start exhibiting, then you’ll probably want to hit the ground running and make sure that you’ll have the highest ROI possible. This means keeping your start out costs lower. But how can you do this without affecting quality? Here are five cost effective tips you can use to increase your ROI. Exhibitions can be both national and local, so keeping it local can keep a lot of costs down. Not only because local shows will have significantly lower running costs to pass onto exhibitors but it will also mean less travel. As a consequence, you won’t need to debate whether to put people up the night before to ensure your staff are well-rested as you can turn up on the day. This saves the cost of hotels and also travel. If you can make sure your staff car-share as much as possible too then that can also save on expenses. Choosing a smaller stand space will be cheaper than choosing a bigger one. This will also mean that you’ll have less space to play with, but if you’re using this as an opportunity to gauge interest and dip your toe in the water then choosing a slightly smaller stand space will allow you to keep costs down. If the show is a success, you can always increase your size for the next show as you grow in confidence. A time to not scrimp on costs is your displays. It’s the first thing that people see to represent your brand and the worst thing you could do is to purchase a ‘one hit wonder’ stand. 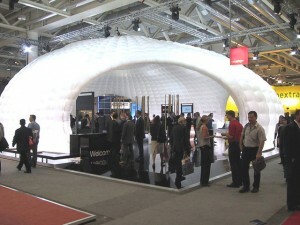 Suppliers such as Express Exhibition Displays can create affordable displays while offering quality assurances. Where you can pull more value from a display is through its design. It can tempting to put your new products on your display but are they going to be relevant for the next show? Keeping your displays simple, branded while focusing on your USPs can make sure that you can use those displays again and again. If you need to use a display with changing information, you could use one element that you update regularly while keeping your other displays as your static branding. This may seem simple, but take your own supplies for when things go wrong. Larger venues will have supplies on hand to purchase in case of emergency but will charge a premium for the privilege. Make sure you take stationary, duct tape, scissors and other accessories that may help if something goes wrong, or that can help you have an easier day.